Considerate Cycling 41: Why Are Some Cities Cycling Or Walking More Than Others? Blog 39 graphed the provisional cycling figures for Bristol as a member of the the “core cities” group of comparable cites outside London. I also included data for neighbours in what was once called Avon. Now that confirmed figures have been published (see here) I have abstracted a table and graph that includes Cambridge and uses this year’s updated figures. For most places the data are derived from a reliable sample of 500 residents. 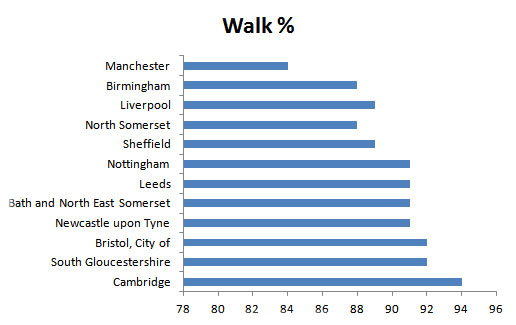 I have added walking to give a broader picture of active travel. 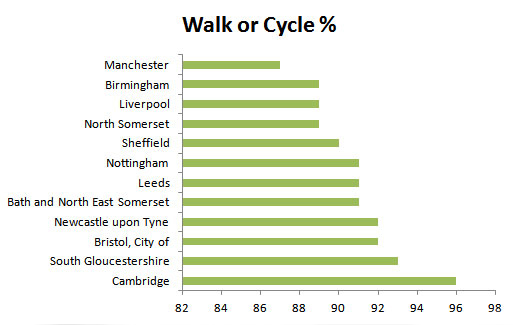 I have been reading (and fascinated by) the recently published “Promoting Walking and Cycling” by Colin Pooley and others and I would be very interested to hear from anyone who has observations about the cultural, geographical and infrastructural variations that might be associated with the wide range of walking and (especially) cycling levels across this group of urban areas. 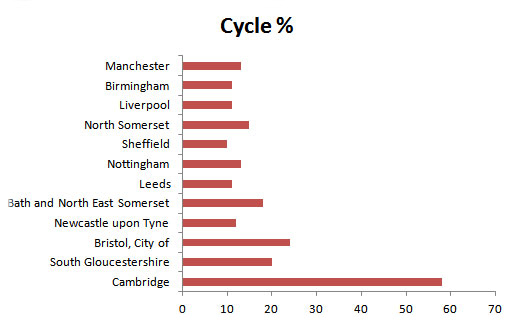 One clear truth is that English cities are not all doomed to the same low levels. One obvious question is whether sheer campaigning effort can generate the big changes in the patterns that the natural and built environments seem to be crying out for. Whichever way you look at the figures in Bristol, the five years up to the end of August 2013 have changed nothing as far as cyclist and pedestrian injuries are concerned. Ten a week is what we are used to and ten a week is what we have come to tolerate as normal. A few die. Some spend time in hospital and quite a lot are sent home after being checked or patched up. We do have a choice in the matter of course. These things can change if we want them to. Consider two photographs taken in Bristol recently. Do we want more of this? Or do we want more of this? My own view is that for about 50p per person per week we could soon have quite a lot more of the latter. Happier cars. Happier pedestrians, happier cyclists. Bristol Cycling Campaign has demanded a City Council commitment of £16 per head per annum. That’s 31p per man woman and child per week. Six and tuppence in old money. Crazy idealists? I don’t think so. Data kindly provided by Bristol City Council as database query outputs. Any errors in analysis or representation are entirely my own.